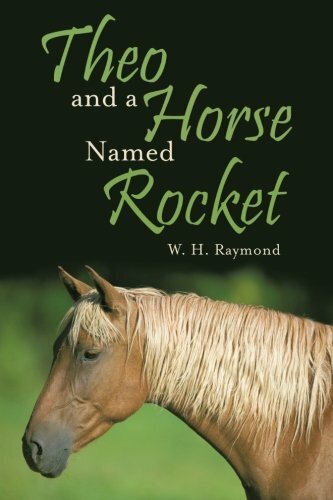 I love books about the human and horse relationship, and this is why I picked up “Theo and a Horse Named Rocket” by W.H. Raymond. However, I found this story to be so much more. It’s a boy’s coming of age, his relationship with his grandfather, his relationship with school, his resilience with life’s tragedies, and about finding his own dreams and passions. The story begins focusing on Theo, a young boy who enjoys going on adventures with his best friend, Winston. Sometimes these adventures can get dangerous thanks to his friend’s love for a thrill, but he is lucky to have Theo’s voice of reason on the first one the reader encounters. Theo’s best times are with his grandfather, as he loves the conversations he has with him during their travels around the countryside of Illinois, and other places within the Chicago area, where Theo lives. His favorite road trip is to a ranch not too far from home in the Illinois countryside where he visits with a Palomino horse named Rocket, who becomes his other best friend. Theo doesn’t seem very interested in school, and is having trouble adapting to his new teacher, Ms. Speedster, but overall he has a wonderful life–until something unexpectedly happens that changes his life forever. N.H. Raymond’s writing speaks to the young crowd as her easy to read style allows the story to flow perfectly from chapter to chapter. Yet, I found the story line will also attract older crowds as they will relate with characters and situations and enjoy it as well for its heartwarming, fun, and full of life story. The only thing that I found would have taken this beautiful book to a five-star read is a little bit more of showing instead of telling. Although the narrator’s voice was spot on, it just told the story in its entirety. Had it had shown more through sensory description and dialogue, it would have made the reader feel more. “Theo and a Horse Named Rocket” by W.H. Raymond is captivating and heartwarming, much more than a boy-horse friendship story! I will definitely recommend it to young and old as a four-star beautiful read!